Step5:If You Want To Handle It On Hand To Find Something, Just Stick Off From The Wall Or Somewhere. 1, Once Stick It To One Place, You'd Better Not Remove To Another Place. Otherwise It Will Lose The Stick. So We Suggest You To Stick It To Some Smooth Surfaces Like Crystal, Wood, Plastic, Gold And So On Which Has Smooth Surfaces, In Order To Stick It Off Easily. 2, When You Change The Battery, Do Not Pull The Plastic Directly. Otherwise The Plastic That Holds The Light In Part Will Break Off. The Right Way, You Should Hold The Plastic Part And Rotate It From Close To Open Switch (you Can See In The Bottom), Then Open It. 3, Before Stick It, Clear Up The Dusty And Mess, Keeping It More Sticky Onto The Surface. 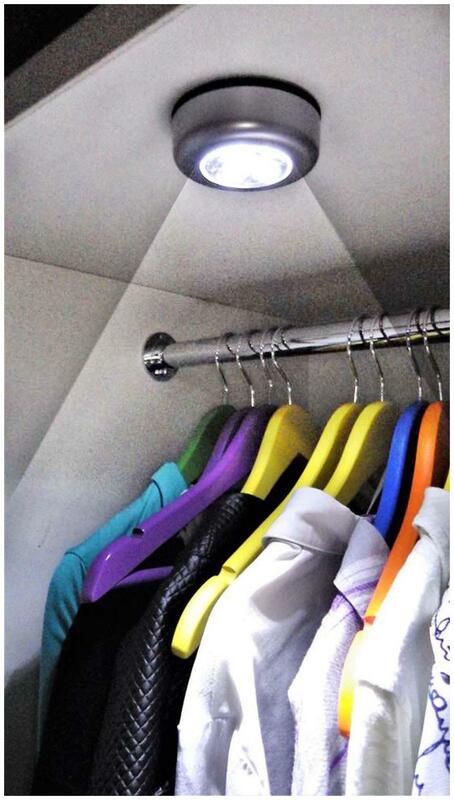 5,This Kind Of LED Lights Are Good For Older And Children Who Often Get Up At Night. Also It Can Be Used Outdoors Like Hiking, Camping, Some Emergency Time And So On. 6, If The Light Around Is Bright You Can Switch It Off In Order To Saving Energy. It Is Small And Cute, So You Can Put It To Everywhere You Like.